The Teach in Bhutan program offers teachers more than just the opportunity to teach eager students in the Land of Happiness. It is also an opportunity to generate an even larger positive impact in the greater community! Warren Tanner has been teaching in the Bhutanese village of Gongthung for the past five months, busy with teaching a full schedule, making new friends, and learning a great deal about subsistence farming and the challenges faced by local farmers. Currently, 80% of the population relies on subsistence farming to support their families. However, the three-month growing season is not enough to meet the needs of those living in this school community. In response to this reality, Warren has developed a plan to grant Gongthung Middle Secondary School and the greater community a Greenhouse! This project, in conjunction with The Bhutan Canada Foundation as part of our School Development Program, is generously supported (in-part) through The EuroCan Foundation. Learn more about this exciting project at Gongthung’s Greenhouse – and stay tuned for updates! Do you wish to make an impact in Bhutan? Apply today to Teach in Bhutan! From the Nation of Gross National Happiness comes a video that is bound to make you smile and maybe even dance! Check out this video that the people of Bhutan created to Pharrell Williams’ song Happy. Tshering Choden was Bhutan’s first female archery player to compete at the Summer Olympic games, a role model for many Bhutanese young girls. In 2004, Holger Riedel (Compass-Film) flew to Bhutan to follow Tshering Choden while she was preparing for the Olympic games in Athens. Holger produced the documentary Bhutan Bogenschutz for Olympia with assistance from Bhutan+partners. An English version was later produced and is now available on Youtube. Enjoy!! Waste management has become something of a big deal for Karma Yonten, who identifies himself as Bhutan’s very own “trash guy”. As Bhutan is becoming increasing more developed, Yonten has realized the importance of recycling waste. In 2010, he developed the country’s first private waste management firm called “Greener Way” and with it, he is teaching the Bhutanese people the importance and vitality of sustainable development. It’s nothing of a big scale project, but merely “just trying to be a responsible citizen,” Yonten says in his interview with the BBC. Click on the video below to learn more about Yonten and Bhutan’s green initiative! In light of “green initiatives” two of our teachers, Tim Grossman and Kendra Matheson have helped to bring waste management programs into the schools of Bhutan. Tim proposed to create the “Waste Management and School Improvement Plan” at his school, Tsenkharla MSS, and Kendra in 2011 at Trashiyangtse LSS helped to supply several waste bins to help improve sanitation. Read more about BCF’s School Development Projects! “The main intent of this initiative is to supply painted oil tins around campus and in the village in conjunction with digging trash pits and supplying the hostels with proper plastic dust bins. All these steps will encourage and facilitate proper waste management skills.” – Tim, on his ambitious plan! A big thank you goes to all the innovators for keeping the rich and beautiful land of Bhutan in tact! Read more about Yonten’s initiative at Generation Change. Like our recent post about Dave Green’s awesome music club at Pakshikha MSS, we’re thrilled to share a story from BCF Teacher Martin and his lovely wife Tara at Wangdicholing LSS in Bumthang, as he experienced his birthday celebrations in true Bhutanese style! I knew already that birthdays were not a big thing here in Bhutan. Except for very young children, nobody really celebrates their Special Day as we do in Canada. In fact, several adults I’ve met don’t even know what day might be theirs, as their parents couldn’t write and kept no birth records. But this month, I witnessed a cultural fusion of East and West to celebrate my own birthday. On my walk to school today, several students stop in the dusty road to bow to me. I’m used to the daily, “Good morning, Sir”, but today I’m greeted with: “Happy Birthday, Sir,” “Best remains of the day,” and “Long life, Sir.” This must be through our neighbour’s daughter, who knew Tara and I were planning a dinner. She told a friend, who told her brother, and in true small town style, my birthday was becoming an event. So these greetings continue all day at school, and I feel so honoured, especially knowing they’ve put it on just for me. As I move through the school grounds, students I teach come to admire my new birthday gho, pinching me as they explain that it’s what you do for good luck with new clothes. When I walk into my own class at 9:00, I hear a hush and a shuffle of desks as I step through the weathered doorway. My Class Captain pushes me back out, apologetically: “Sorry Sir, would you come back in again?” This time when I cross the threshold, he reaches above me with a bamboo stick and bursts a yellow balloon pinned to the lintel, showering me with flower petals. The class erupts with a vaguely familiar melody, standing to chant “Happy Birthday to you!”. I have to say, this is about the only time they’ve used the pronoun “you” with me; they’re trained to talk to their teachers in the third person….”Does sir…?”, “Would Sir…?”, “When could Sir…?”, etc.. I turn back to the rough chalkboard and notice it’s been covered with colourful birthday wishes in both English and Dzongkha. And they’ve taped balloons in various corners of the room, which really brightens up the chipped plaster and fading paint. It’s a party! I can’t bring myself to start a lesson now, and this is no time for one of our pre-lesson meditations, so I ask them to be seated and hand out peanut butter cookies I was saving for later. Here at school, the only indication of birthdays is when primary children come into the staffroom offering candies. They move from teacher to teacher holding out a small bucket of Indian toffee, standing without a word in their school uniform, perfect replicas of the adults in their national dress. So the tradition here is all about giving rather than receiving. I’d prepared myself for this part by baking the night before. After the cookies, the class asks me to sing, so I share a Québecois birthday song. Then two of my oldest grade 7 boys–“repeaters”, at 16 and 17 years old—come to the front of the room and sing two love songs in Dzongkha. One song is sad, but they’re both so beautiful, and obviously shared with pride. In Bhutan all singing, both traditional and pop, tends to have lots of controlled vocal decorations wrapped around simple melodies, and these boys have mastered the technique. The class is quiet, but cheers the singers on with expectant faces and grins. I am in awe of this spontaneous celebration and feel so honoured. I tell them this, but how could they really understand what it means to me? Most have never been farther than the next Dzongkhag, let alone another continent. It’s another of those moments we privileged BCF teachers have, when we consider pinching ourselves to be sure we’re awake and really experiencing this. Sometimes my own culture at home by comparison seems so vague and diluted, lacking that strength of unity that is simply “how we do things” for children in Bhutan. “When former Saultite Jamie Zeppa started writing a fictional story based on the three years she spent teaching in Bhutan, she was told it would be better as a memoir. She took that advice and never looked back. The end result was Beyond the Sky and the Earth: A Journey into Bhutan published in 1999. That same year, the memoir won the Banff Mountain Book Festival Award for Travel Writing. The book has also been published in ten countries and translated into seven languages. Jamie Zeppa. Photo Credit: Sault Star. “The author/college professor is looking forward to an upcoming visit to Northern Ontario where she’ll be guest author at a Stories in The North literary event Saturday in Thessalon…Stories in the North, Thessalon’s Literary Festival Committee, is pleased that Zeppa agreed to come to Thessalon for their one day festival. She’ll teach two writing workshops. The morning workshop, The Art of The Sentence, will see participants study some of the most memorable sentences in English literature and learn techniques to create special effect sentences. To reserve workshop spots or get tickets for the evening show, contact Angie Gallop at 705-842-2451 or e-mail angiegallop@gmail.com. Read the whole article, written by Pauline Clark for the Sault Star at Jamie Zeppa has covered much ground since leaving Sault; lends knowledge to weekend workshop. Wildsight Invermere is proud to host Dasho Kinley Dorji, a journalist and government official from the Himalayan nation of Bhutan. His presentation, Within the Realm of Happiness: a Himalayan Perspective, will take place on Monday, October 29 at 7:30 p.m. in the Invermere Community Hall. Tickets are $12, and $6 for students, available at Circle Health Foods, The Book Bar and online here. Bhutan, a country most people have never heard of, is unique for many reasons. Its catchy tourism tagline boasts “Happiness is a Place”. While the rest of the world interprets development purely as economic development, Bhutan identifies Gross National Happiness (GNH) as the goal for human development. Since Bhutan’s fourth king, Jigme Singye Wangchuck, came up with the idea of GNH in 1972, the concept has spread to other countries. The Bhutanese have an inherently strong belief that if they preserve their culture, their environment, and ensure that economic development is sustainable, it will enable the people to find and maintain happiness. Their government has instituted measures that have caused the rest of the world to pay attention. For example, the constitution states that 60% of the country must remain as forests. The “Finding Balance” forum organized by Wildsight last March generated valuable discussion on the links between conservation, economics and wellbeing. Now Dasho Kinley’s talk is a chance for valley residents to consider other paradigms for living and to question what is really important to us as we pursue wealth and prosperity in the East Kootenay. 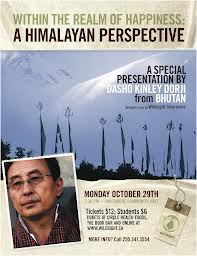 Dasho Kinley is the former managing director and editor-in-chief of Kuensel, Bhutan’s national newspaper, and is the author of a collection of short stories, Within the Realm of Happiness, which was published with assistance from the Canadian Co-operation office in Bhutan. Currently Secretary of the Ministry of Information and Communications in Bhutan, he’s well placed to explain the concept of Gross National Happiness. He will discuss both the theories and challenges of instituting GNH into every day life in Bhutan. Those who packed the Invermere Community Hall this past June to hear Dr. David Suzuki’s rousing talk on the economic/environmental challenges of the 21st century will be interested to know that Dasho Kinley and Suzuki are headliners at the Banff Mountain Film and Book Festival right after his Invermere presentation. They will appear together live on stage to have a conversation on the topic of GNH. What can we in the Rocky Mountains learn from a tiny Himalayan kingdom in Bhutan? For the past two years, Bhutanese students Gaki and Yeshi have studied at Blyth Academy Yorkville, through a scholarship provided by Blyth Education and The Bhutan Canada Foundation. 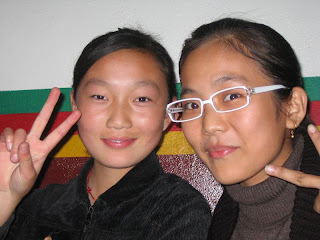 This April, Gaki & Yeshi will complete their studies and head back to Bhutan to pursue their dream of becoming doctors. In September 2012, two new Bhutanese student scholars will arrive from Bhutan to complete two years of study at Blyth Academy. The Student Scholar program is made possible in part through generosity of billet families who are willing to provide room and board for these students. What’s it like to be a billet family? Peyton, the host sister to student scholars Gaki &Yeshi, told us a little bit about her experience. How did you and your family learn about the billet program through BCF? P: In March 2010, I went on a volunteer trip to Bhutan. While I was there, I was amazed by the kindness and generosity of the people. It is an incredible country, and when I came home from my two-week journey, I told my parents about my experiences. They wanted to get more involved with Bhutan, and when Sam Blyth told them about the billet program, they were immediately interested. What has it been like having Gaki and Yeshi live with you? P: It has been an amazing experience having Gaki and Yeshi living with me. After my brother left for university, I was an only child in my house, but having the girls there was like having two sisters. It has been great being able to show them around my hometown and just hang out with them. Have you noticed a change in the girls since coming to Canada? P: I think the girls have changed since coming to Canada. The Canadian and Bhutanese cultures are fairly different so I have noticed that the girls have blended the two cultures. They are more talkative and inquisitive, and enjoy making the most of opportunities. What do you think living and attending school in Canada has taught them? P: I think that Gaki and Yeshi have become more open to experiences and more outgoing. They have become more worldly and more open minded. They have also tried new subjects and expanded their interests. I think it has taught them to be more independent and self-confident. How have you and your family benefitted from hosting Gaki and Yeshi? P: My family and I have benefitted a lot from having the girls live with us. We have learned so much about Bhutanese culture – a culture full of respect, patience and understanding. It has been amazing discovering our own home city through their eyes and watching them grow into mature young women. We have learned to be more adventurous and grateful for all the opportunities we have. Are you interested in billeting Bhutanese students studying in Toronto? Click here to find out more. Shirley-Dale Easley, esteemed educator and long-time friend of Bhutan, passed away February 7th. Shirley – Dale was a supporter of Bhutan for almost twenty years and worked on a number of projects involving Bhutan throughout her career as an educator. One such project, based out of Zhemgang, saw four or five Bhutanese teachers come to Canada each winter to work with Canadian colleagues. This program helped Bhutanese teachers develop skills and empowered them to share these skills with their colleagues back home. Shirley – Dale also served as an adviser on the development of the new Bhutanese English curriculum, which was developed with CIDA. Near the end of 2011, Shirley – Dale donated 1,000 books to BCF, which were then sent of Bhutan to be distributed to needy school libraries. Shirley – Dale had spent a great deal of time collecting and organizing these books – each box was carefully labeled with its contents and the name of the school that she asked it be delivered to. 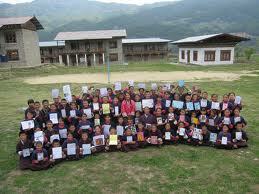 The last of the books donated by Shirley – Dale arrived in Phuntsholing, Bhutan just three days ago. Shirley – Dale will be greatly missed. Her spirit will live on in all those who knew her. On Friday October 7th, 2011 His Excellency, Lhatu Wangchuk, Ambassador and Permanent Representative of the Kingdom of Bhutan to Canada and the United Nations and BCF Board Member, announced the appointment of Sam Blyth as Honorary Consul for Bhutan in Canada. “I am honored by the appointment and am delighted to serve Bhutan and it’s people both as Honorary Consul and as Chair of the Bhutan Canada Foundation”, said Sam Blyth.